Saltwater Angelfish make stunning additions to the home aquarium. All of the varieties exhibit unique and exotic colors and patterns making them true living decorations. 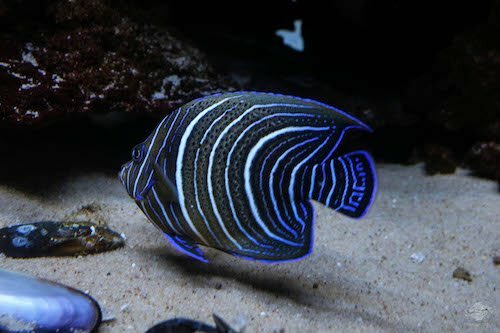 While most varieties of saltwater angelfish show off bright, neon colors, the Koran Angelfish or Semicircle Angelfish (Pomacanthus semicirculatas) is unique in that its body is mostly silver with the fins being lined with neon blue. Although not as flashy as some of the other varieties, the Koran Angelfish exhibits a more subtle and refined beauty. The fish gets its semicircle name from when they’re in their juvenile state. As juveniles (as with most saltwater angelfish) they look very little like their adult counterparts. When young, these fish exhibit a darker color with curving stripes, one of which resembles a C or semicircle. The Koran Angelfish hail from the waters off Queensland, Western Australia and New Guinea. They can also be found in the waters of the Indian Ocean and even in the Western Pacific. 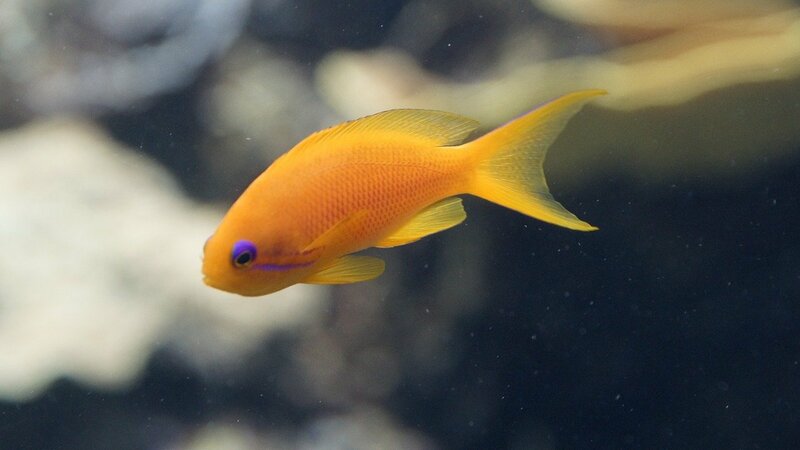 This is a popular variety of saltwater angelfish particularly because it’s a little easier to keep than other varieties, which make it ideal for the beginning hobbyist. With proper care and attention these fish are known to live 20 years and longer in captivity. The Koran angelfish can grow quite large, up to 15 inches, which means you’ll need to give it plenty of space. Most experts recommend a tank of at least 135 gallons, although you’d be better off with a tank of 225 or larger. A larger tank is recommended because this fish eats a lot of food, which means increased waste, which means an increased bio load, which can foul the water quickly in a smaller tank. While not as finicky as other varieties of saltwater angelfish, the Koran Angelfish still requires pristine water quality for it to thrive. It’s recommended that you perform water changes of 30% every month or 15% every 2 weeks in order to keep nitrates lower. Despite this guideline it’s vital that you perform regular water tests to ensure things are where they need to be and to know if a change is needed. Water parameters are as follows: Water temperature range should be 72˚ – 82˚ Fahrenheit, pH range of 8.1-8.4, medium water hardness, and a specific gravity of 1.023-1.025. As with virtually every other variety of saltwater angelfish, the Koran Angelfish needs to be introduced into a biologically mature tank that’s been running for at least 6 months. Decorations should include plenty of rock with enough hiding places into which they can duck if they feel threatened. Also, as they can be quite territorial, it’s recommended that these fish be the last added to your tank. If you have a reef environment in your home set up you should be aware that these fish will eat large polyp stony corals and most soft corals, so they’re not entirely reef friendly. 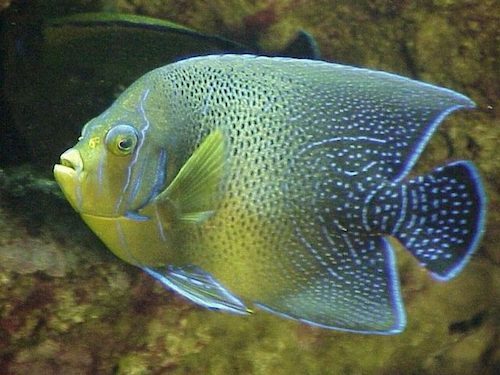 The Koran Angelfish, although generally solitary, is moderately aggressive, however they should do well in a community tank provided you house them with the appropriate tank mates. They will be hostile to other angelfish and smaller fish like clownfish or gobies. It should also be noted that these fish don’t react well in aquariums with a lot of foot traffic, as it can frighten them and case stress. 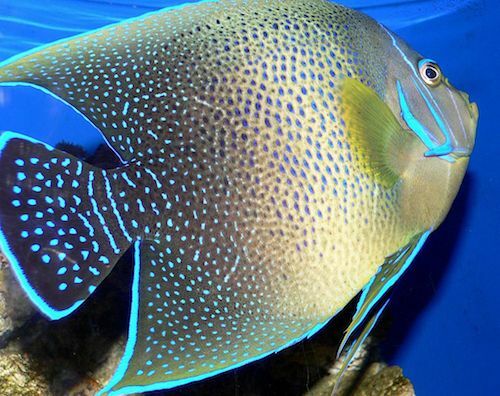 As stated, the Koran Angelfish is a hardier fish than other species, but you’re still going to have to stay vigilant about care if you want to keep them disease free. 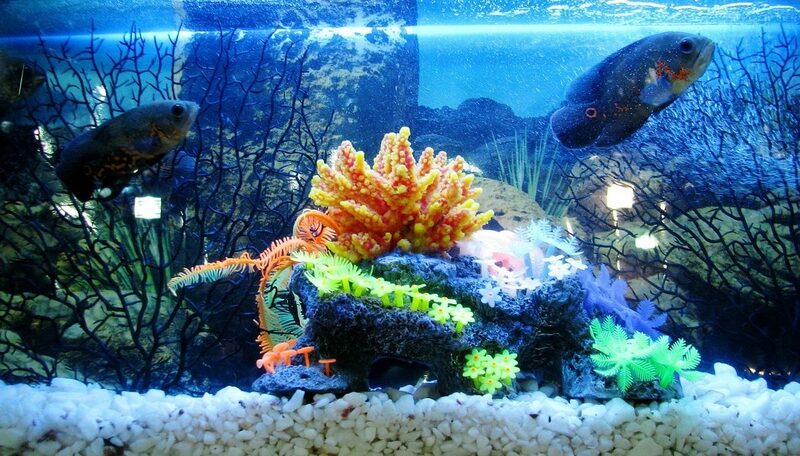 Common diseases affecting these fish is Saltwater Ich (Cryptocaryon irritans) Marine Ich or simply Crypt. You can tell if your angels have this disease by the tell-tale white spots that cover the body, and the ‘scratching’ behavior in which the fish rubs against rocks. Another common disease is called Marine Velvet (Oodinium ocellatum), which manifests as a brownish/yellow dusting or coating all over the body. Symptoms also include cloudy eyes, clamped fins and difficulty breathing. These and many other saltwater angelfish diseases are often brought on by stress, which can be the result of poor water conditions, poor diet, and housing them with inappropriate tank mates. As always, however, a little diligence and attention to proper care goes a long way to keeping these fish healthy and happy. 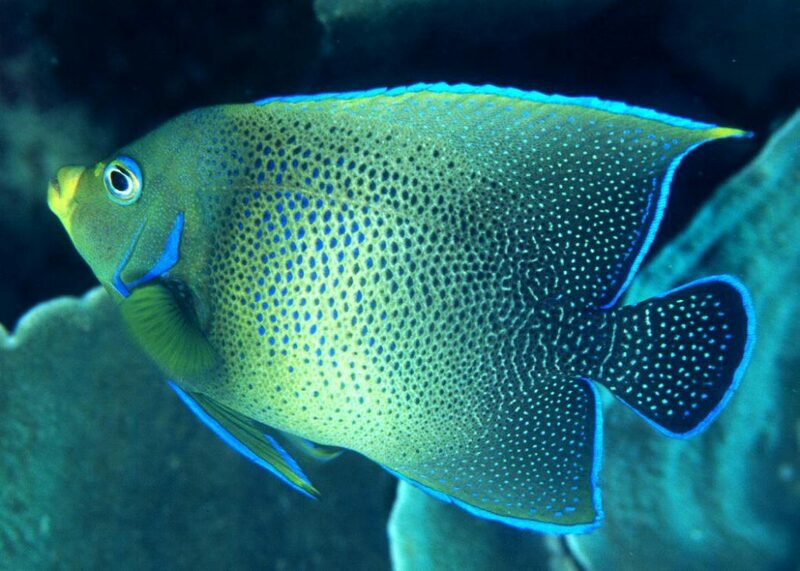 In the wild the Koran Angelfish will eat sponges, tunicates, algae and encrusting animals. At home, you can keep these fish happy with a diet that includes sponge, which can come in a high quality flake or tablet form. Also, frozen foods are accepted as well as fresh meat, such as chopped scallop, squid and shrimp. There are also some commercial foods that contain color enhancers, which you may also use. Recommended feeding is 3 or more times a day. Breeding the Koran Angelfish is easier than most varieties of saltwater angelfish, but they only successfully reproduce in large commercial aquariums. Home set ups are generally too small to encourage breeding. Tank size: 135 gallon minimum 250 – 300 recommended. The Koran Angelfish is subtle in its elegance with its muted colors and impressive size. 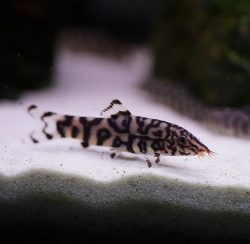 Their overall hardiness make them ideal for the beginning hobbyist, and provided you’re vigilant about care, these fish should live upwards of 20 years or more.